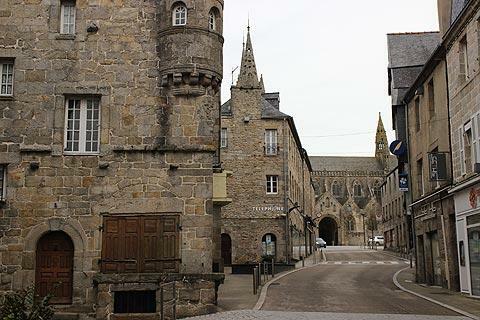 Saint-Pol-de-Leon is a town 15km northwest of Morlaix, near the coast in the Finistère department of north-western Brittany. 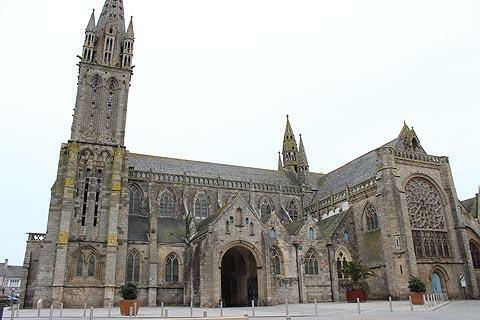 The town centre is attractive with several interesting buildings to enjoy including a substantial cathedral and some impressive renaissance houses, as well as having easy access to the coast of northern Brittany. All the principal highlights in Saint-Pol-de-Léon are close together near the square that includes the cathedral. The two most important monuments in the town are both religious: the Cathedral Saint-Paul-Aurelien and the Chapel of Notre-Dame du Kreisker. The centre of Saint-Pol-de-Léon is quite small and doesn't take long to explore but a visit is recommended when you are in the region. Cathedral Saint-Paul-Aurelien: dominating the town, the gothic style cathedral dates in part from the 13th - 14th century (the facade and side walls), with the remainder (the choir and chapels) being reconstructed in the 16th century. 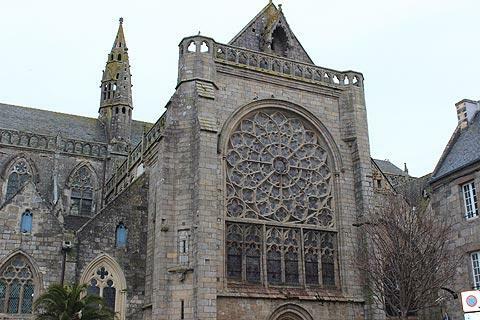 The cathedral has an impressive facade with 50 metre high ornate towers on either side and a balcony from which the bishop could address the church followers. 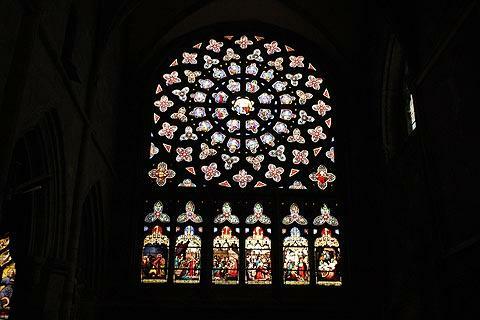 Inside the cathedral, which holds the relics of Saint-Pol, there is a great deal to admire including numerous stained glass windows from the 14th to 17th centuries, a substantial rose window, some carved wooden stalls and a 17th century organ. Just to the left of the cathedral you can see the Town Hall. 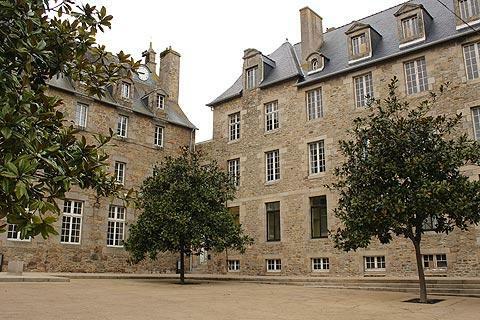 This was built in 1706 as an episcopal palace, with the west wing then added in 1750. 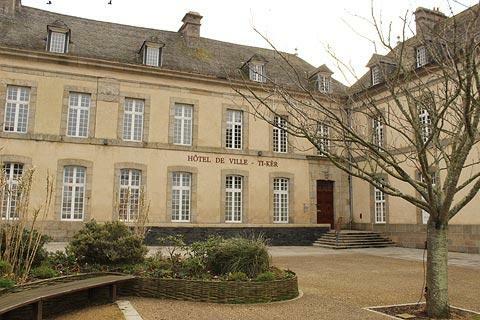 It has been used as the Saint-Pol-de-Léon town hall since 1830, it's role as a bishops palace having ended with the French Revolution. The architectural style is simple yet elegant typical of the Age of Enlightenment. 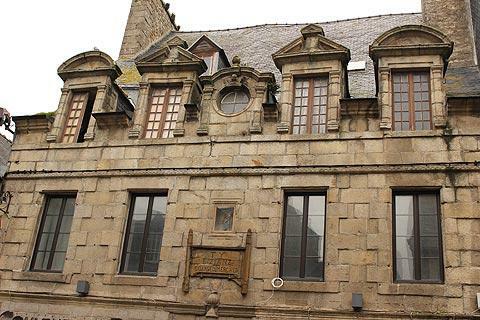 Maison Prebendale: Among our favourite non-religious buildings in Saint-Pol-de-Leon is the Maison Prébendale, the 16th century house in Grande Rue that was previously used by church dignitaries - it is now used primarily for art exhibitions. Even if there is not an exhibition at the time of your visit you can admire the outside of the building with its renaissance style entrance, ornate windows and central square tower, and the statues that decorate the roof. A little further along Grand Rue you can see the Lycée Notre-Dame du Kreisker. Built around the same time as the Town Hall and similar in style if a little less elegant. Before the Revolution this building held the Grand Seminary of Léon, then later as a convent and school for young girls. It is now a Catholic 6th form college. Opposite the lycée is the Chapel of Notre-Dame du Kreisker: Building of this roman style chapel was completed in the 15th century. 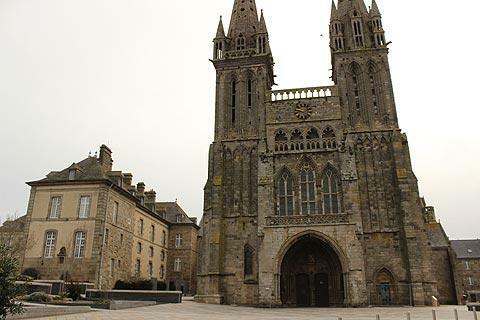 Much the most prominent feature is the 78 metre high belfry, which is the tallest to be found in Brittany. You can climb up inside the belfry for lovely views out to sea and across Saint-Pol-de-Leon itself. 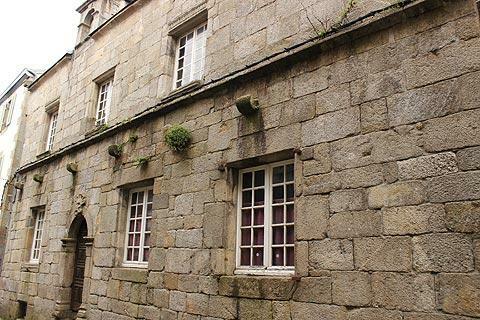 In the streets near the cathedral Saint-Pol-de-Léon there are some other interesting buildings, including manor houses dating from the 16th and 17th centuries such as the Manoir de Keroulas. Several have small carved reliefs and architectural features, and also informative information panels that explain the history of the houses. The beach at Kersaliou is the closest to here and a little way to the east of Saint-Pol-de-Leon. There is also a very attractive coast path that heads south from Kersaliou and passes along the harbour in Pempoul port as well as two more popular beaches and some scenic viewpoints - be sure to walk out along the Saint Anne beach (isthmus) for views from the islet at the end of the beach. Note: the beach at Saint-Anne has received the Blue Flag award for its cleanliness and facilities. 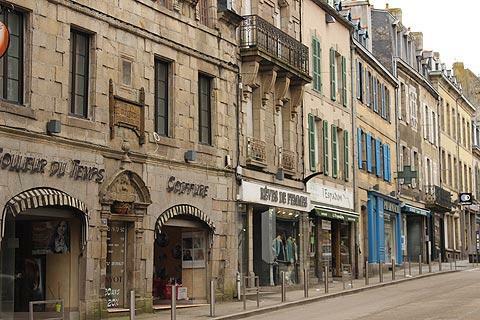 There is a great deal to explore along the Finistére coast, but in particular we recommend you take a walk around the historic centre of Roscoff, just a few kilometres from Saint-Pol-de-Léon and with some lovely historic buildings, and also visit Morlaix to the south with its numerous medieval houses.